▷ Does Apple Cider Vinegar Unclog Arteries? / Does Apple Cider Vinegar Unclog Arteries? Does Apple Cider Vinegar Unclog Arteries? Y'all. I love apple cider vinegar. On my face as a nightly toner, or in my morning water, I swear by it as the stuff of gods and a general cure-all. Got a bug bite? Apple cider vinegar! Struggling with a yeast infection? Apple cider vinegar! Feeling a little sick and need a solid gut booster? Apple. Cider. Vinegar. Seriously, the stuff has changed my life. I have been taking it daily for my immune system and internal pH, but I recently got to marveling at how much it does – even for weight loss and our metabolisms. Check out this study done on rats. As far as dry studies go, it's basically raving about the potential of apple cider vinegar for weight management, citing a "highly significant decrease" in both weight and the amount of food they ate. Just by incorporating apple cider vinegar into their diets. Wow! At this point in my relationship with apple cider vinegar, I was head over heels. Is there another food that can even hold a candle to this elixir of life? If just a few tablespoons of this stuff daily can work all these miracles, what else could it do? While on my quest for information about its metabolism-boosting properties, I came across a few YouTube videos claiming apple cider vinegar could even clear your arteries. My interest was definitely piqued. So off I went googling, this time to see what I could dig up about artery health. The results? A wealth of health blogs purporting its ability to clear arteries - without any external links to reliable studies. The lack of links got me more than a little suspicious; whenever I start to write, I'm eager to share my findings with the whole world – sharing knowledge is sharing health! This lack of supporting articles got me digging. I even dove into PubMed, a dense government database of clinical studies and their abstracts. I skimmed through a list of all the studies on apple cider vinegar, and didn't find any that have even done the research about apple cider vinegar's ability to clean out arteries. Not a single peep. I know, I know. It's disappointing to find out that apple cider vinegar isn't a true catchall for any ailment. But just because this one thing doesn't seem to have much scientific backing doesn't mean all the other amazing things about apple cider vinegar don't matter! And I still found a lot of good news. Although I came up empty-handed regarding apple cider vinegar and artery health, I did find ample studies linking apple cider vinegar to lowered cholesterol, regardless of other dietary changes. Even Harvard has conducted a study that had promising results about apple cider vinegar's ability to regulate blood sugar levels in people with Type 1 Diabetes. But what if that doesn't matter to you? 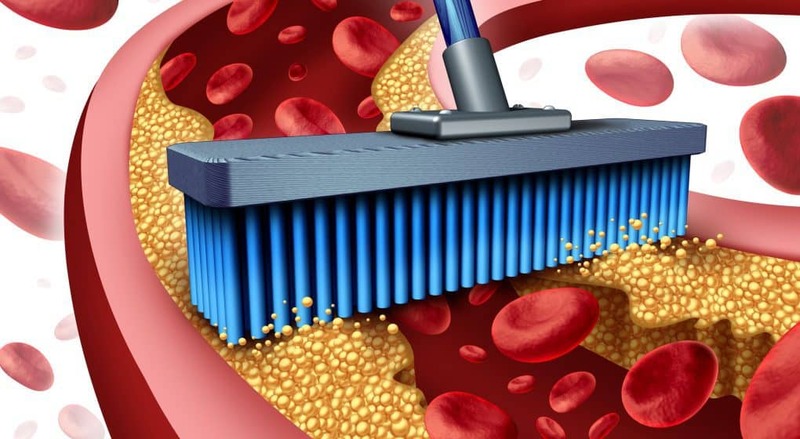 What if you stumbled across this article looking for some ways to unclog your arteries naturally? You're in luck. All that googling led me to some really amazing healing techniques to clear out those arteries. Like this drink – a mix of equal parts garlic juice, ginger juice, apple cider vinegar, and lemon, plus an ample dose of honey. This sounds like a potent combo, but if it's half as powerful as I'm sure it's gotta smell, then our bodies are all in luck. If a strong brew isn't your cup of tea, don't worry! There are tons of other great options for clearing those arteries. Over at Step to Health, they recommend several delicious foods, like avocado, tomato, walnuts, and spinach. That sounds like the humble beginnings of one heck of a salad, if you ask me. Perhaps the tastiest recommendation is the inclusion of pomegranate. The website Green Med Info, a heavily research-focused, holistic healing site, suggests pomegranate (or pomegranate extract) for keeping arteries clear and healthy. I could start the morning with some pomegranate juice, no hesitation. But what if you aren't that keen on the idea of doing a complete 180 with your diet? If that's the case, over at Livestrong they remind readers that there are always supplements like Coq10, Omega 3s, and alpha-linoleic acid, which all work to keep arteries clear. Regardless of where you're at in your health journey, it's important to keep in mind that almost all natural remedies are in fact a complete lifestyle and diet change. And dietary shifts like these are never an overnight, quick fix. Instead, they're meant to reverse the damage we're facing in a way that's healthy, intentional, and lasts for the rest of our long, vibrant lives. While I'm a little bummed that apple cider vinegar can't magically solve *all* of my issues, I'll take what I can get with the wealth of new information – and probably up my walnut and pomegranate game while I'm at it. What changes can you make for your artery health? What is a Safe Daily Dosage of Apple Cider Vinegar (ACV)?